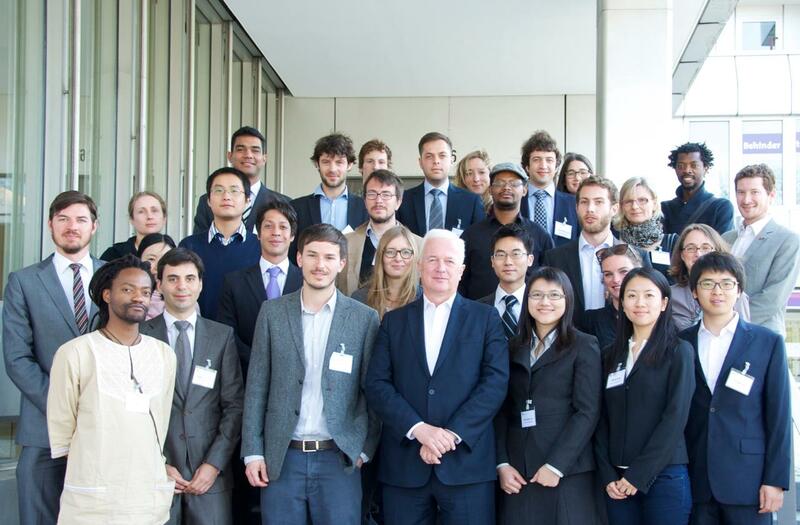 The First Berlin Forum On Global Politics is an initiative of the doctoral candidates of the Graduate School of Global Politics (GSGP), the doctoral program of the Center for Global Politics (CGP) at the Freie Universität Berlin. The CGP is organized by Prof. Dr. Klaus Segbers at the Department of Political and Social Sciences at the Freie Universität Berlin. The Center offers a European intellectual response to challenges and opportunities caused by globalization. The GSGP, however, is unique in the fact that it is the first joint doctoral program between Germany and China in the Social Sciences. Dissertation topics focus on international relations, with an emphasis on Global Politics and European-Chinese relations. In this way, the doctoral dissertations and activities of the GSGP develop new ideas to promote bi- and multilateral cooperation and contribute to international academic dialogue. The study program is multidisciplinary so that doctoral candidates broaden their conceptual, theoretical and empirical horizons considerably. 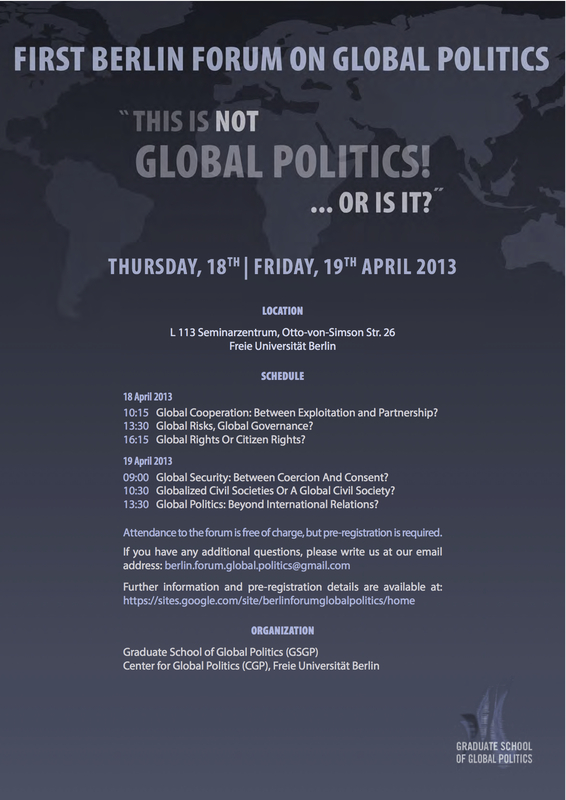 In the spirit of the GSGP, its doctoral candidates have established the First Berlin Forum On Global Politics, to be held 18th and 19th April, 2013. Also multidisciplinary in nature, it broadens the academic discussion usual to conferences and fora inasmuch its conference attendees are not only university professors and students, but also experts and researchers at policy institutes and think tanks and consultancies, representatives of non-governmental organizations, and socio-political activists from civil society organizations. This year’s Berlin Forum On Global Politics is entitled ‘This Is Not Global Politics! … Or Is It?‘. The title is inspired by Belgian surrealist painter René Magritte’s famous self-portrait, Le fils de l’homme. In the same way that the hovering green apple in the painting hides the face of the man in the bowler hat and yet leaves it visible, so do global challenges hide the potential of global responses, and yet leave them visible. The question that Global Politics pose is similar to the question that is posed by the painting: what is present behind what is hidden, yet visible, before us? Global politics seem to imply that global challenges call for corresponding global responses. However, a consensus about the meaning, form and scope of the latter has not yet been achieved. In this sense, this year’s Forum has as its objective to address a series of interrogatives in order to move further towards a common standpoint. A first range of questions arises from the very definition of ‘global.’ What is the global and how does it differ or not from the international? Is the idea of the global and a global response culturally informed? The second range of questions relate to the effect of globalizations on today’s politics. What are the role of the state and the nature of sovereignty in a more globalized world? Is the state retreating, fracturing or becoming stronger? The third range of questions deal with the strategies and instruments that comprise the global response. How can global governance become more just and efficient? Who should have a say in the decision-making procedures of the international community, and how much of a say should emerging powers, developing countries, and non-state actors have vis-à-vis the consolidated developed countries’ hold over international institutions and law? The Berlin Forum On Global Politics has the intention to freely and openly distribute as much of the conference, its discussions and conclusions, as is achievable. The call for abstracts and conference proceedings will be readily available to the public, and in the cases in which conference attendees are interested and explicitly consent, both the draft papers and video recordings of the presentations at the conference will be licensed as Creative Commons. Furthermore, if you are in Berlin the days of the conference and are interested in attending the conference as a member of the public, either simply to listen to the presentations or engage in the feedback sessions for each panel, you are more than welcomed to join us. You can do so, free of cost, by way of written pre-registration. Please write an email with your complete name, institutional affiliation (if any), and the specific days which you wish to attend, to contact@bfogp.org. Please do note that attendance will be limited to the capacity of the conference’s seminar room, so be quick to pre-register if interested!